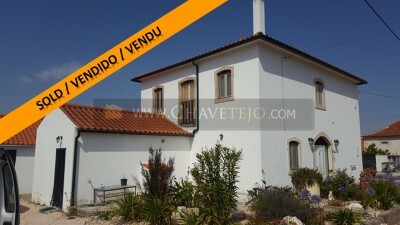 A detached house with three bedrooms and two bathrooms, large garage/workshop, on 10,500 sq m of land, located on the edge of a village 10 minutes from the historic City of Tomar, Central Portugal. With land to the front, side and rear of the property it is quiet and private. There is potential to convert the large garage into additional living space or a separate annex, with the correct permissions. This totally renovated, ready to move into two storey property sits within 10,500 sq m of easily workable land, with a small river running at the bottom of the land. There are currently over 80 established olive trees, three walnut trees, a number of fig trees plus damsons, pears and various other fruit trees. The land benefits from a well and a borehole for irrigation. There is more than enough space to at least double the number of trees and still have plenty of room for growing vegetables and installing a swimming pool. There are two large patio areas, a threshing circle plus an alpendre at the rear of the house. A large above ground water storage tank is also in place, but has been adapted for parking for a large motorhome, this could easily be reinstated as a tank or even a pool. The garden immediately surrounding the house is fully enclosed with chainlink fencing so is child and dog friendly. Having been recently renovated the property already has solar panels installed to heat the hot water and it is fully double glazed. Both the house and the garage/workshop have completely new roofs including all of the timbers. The entire property has been re-rendered, completely re-wired and has all new plumbing and drainage. A wood burning stove with a back boiler has been installed. This runs the central heating system and hot water for the cooler months. All kitchen and utility appliances, large satelite dish and some items of furniture are negotiable in the sale. -: The large front door brings you directly into the lounge/diner. Here there are French doors opening out onto the alpendre area at the rear of the property. Both the front door and French doors benefit from internal wooden shutters as does the window in this room. Within this room a feature stone wall and exposed wooden beams have been retained. In one corner of the lounge area sits the wood burning stove with its back boiler. This has a beautiful stone mantel and surround. The room also has two radiators. The lounge has tiled flooring, ample plug sockets and tv point. As the lounge lies in the centre of the house, from here you have access to the kitchen, hallway and downstairs toilet. -: The doorway to the kitchen is set within the feature stone wall. The kitchen is fitted with handmade wooden floor and wall cabinets and has black granite worktops. The floor is fully tiled and there are wall tiles above the worktops and above the cooker. There is a stainless steel double sink with drainer. Above the large freestanding cooker is a stainless steel extractor hood. Plumbing has been installed for a freezer that may have an ice making machine or for a fridge that dispenses water. Plumbing is also installed for the dishwasher under the worktop to the side of the sink unit. The kitchen has ample above worktop sockets and there is a separate fusebox should the kitchen require isolating for any purpose. The kitchen has a beautiful high ceiling with exposed beams. The double glazed window here in the kitchen has external aluminium shutters. The door to the side of the kitchen leads directly onto the driveway parking at the side of the property and the second doors leads into the utility room/larder area from where you have access to the garage/workshop. -: The large utility/larder area has ample storage space and shelving. Electric sockets and plumbing are installed for washing machine, tumble dryer and freezer. Housed within the utility area is the water tank and control unit for the borehole water supply. The storage/larder area had fully tiled flooring and the utility area also has fully tiled walls. -: The fully tiled downstairs toilet off the lounge area has a heated towel rail that runs in conjunction with the central heating and an extractor fan. There is also a large cupboard that houses the main fuse box for the property, a switch for the emersion heater should you require it, the control unit for the solar panels and a 200 litre water storage tank. -: A small hallway off the lounge leads to the office and staircase for the first floor. The window in the hallway is double glazed and has an internal wooden shutter. The floor is fully tiled. -: The office has ample plug sockets and has previously been utilised as a single bedroom. It has tiled flooring. -: The mahogany laid staircase takes you to the first floor. At the top of the stairs are double doors giving access to the useful outside staircase. There is another fuse box for isolating this first floor area and a hatch for access to the large loft space. -: The family bathroom is off the hallway. It is fully tiled with an enclosed shower unit, sink, toilet and bidet. There is a heated towel rail that runs in conjunction with the central heating system and an extractor fan. The window is double glazed with obscured glass. -: Off the hallway there are three large light and airy double bedrooms, all with double glazed windows and radiators. The master bedroom has its own fully tiled en-suite bathroom, with a large enclosed shower unit, sink, toilet and heated towel rail. There is also an extractor fan fitted. This master bedroom has two windows one of which gives a view to the front and other a view to the Eastern side of the property. It also has double French doors with small railing outside, which again face East. There are numerous plug sockets and a tv point. The second bedroom provides views to the rear of the property, giving a view over the main olive grove and to the hills beyond. This is a South facing room with two windows. There are numerous plug sockets and a tv point. The third bedroom is also a double room and gives a view to the Eastern side. Plenty of plug sockets and a tv point. The first floor hallway and bedrooms all have wooden flooring. The driveway at the side off the house leads to the very large garage/workshop. It has an up and over door which can easily be converted to an electric opening door. This large space has a completely new roof including the wooden beams which have been left exposed. The outside of the building has been completely re-rendered. There are two double glazed windows along the back wall along with a door which opens onto a patio area and the rear of the land. Another door at the side opens to the garden. An internal sliding door gives access to the utility room and then onto the kitchen. Electricity has been installed in this area and it could easily be converted into additional living space for the house or into a separate annex if appropriate permissions were granted. The village of Marmeleiro has its own cafe/social club which organises various village events. There is also a chapel and small school. The village is serviced daily by bread delivery vans and has a bus service that runs through it. Being surrounded by vineyards there is also an award winning Winery in the heart of the village where you can purchase some of their excellent wines directly from them. Within a few minutes drive of the village are two olive processing facilities, along with numerous cafes and restaurants. There are also two mini-markets, a petrol station, plus a number of builders merchants and agricultural suppliers. Tomar is ten minutes drive away. The beautiful Castelo de Bode lake is within a twenty minute drive, and the surrounding area has many superb river beaches. The large town of Torres Novas is within 15 minutes and Entroncamento, with its mainline railway station is also within 15 minutes. From Entroncamento you can take trains to Porto, Lisbon and beyond. The fast train to Lisbon takes less than 50 minutes from Entroncamento. Tomar also has an excellent train service although less frequent. The Silver Coast town of Nazaré is just an hour drive away and Lisbon airport is 1 hour and 15 minutes. From the property there is easy quick access to a number of motorways and major roads, truly Central Portugal.